Lambeth Council and Metropolitan Police have taken decisive action against a group who are intimidating local residents and businesses by introducing a new dispersal zone on the Bolney Meadows estate. The dispersal zone will be enforced from Wednesday, August 12, until Thursday, February 11, 2010, and has been designed to specifically target a group of young people and 19 to 35-year-olds, who mainly gather outside a parade of shops in Dorset Road. The six-month dispersal zone is being put in place following complaints received by the Oval and Stockwell Safer Neighbourhood Teams from residents and local businesses located on the Bolney Meadows estate, which is also known as the South Lambeth estate. The reports include incidents in which the gang have openly sold drugs in flat stairwells and outside shops, vandalism, street drinking, harassment and intimidation. Councillor Mark Bennett, Cabinet Member for Community Safety, said: "The local community on the Bolney Meadows estate has asked for our help and we have taken decisive action in response. No one should feel intimidated or harassed when they visit their local shops to buy a pint of milk or are verbally abused and threatened as they make their way home. This new dispersal zone sends out a clear message that anti-social behaviour will not be tolerated." Superintendent Paul Wilson, said: "We will not tolerate drug dealing and anti-social behaviour in Lambeth. The introduction of the new dispersal zone assists with our mission to make Lambeth a safer place. Residents have raised their concerns to their local Safer Neighbourhood Teams and in partnership a dispersal zone has been agreed. In conjunction with the introduction of this new dispersal zone we will proactively target those individuals who cause anti-social behaviour in the borough of Lambeth. The Dispersal Zone gives Lambeth police greater powers to tell individuals to leave an area where their presence is causing local residents and the business community to feel threatened and intimidated. Those asked to disperse from the area will have their names and addresses taken by officers, with repeat offenders being put forward for further enforcement including an Anti-Social Behaviour Order (ASBO). A team of Lambeth Council youth workers will also be on hand to offer young people information on local activities offered by the council throughout the school holidays. 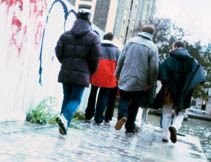 Section 30 of the Anti-Social Behaviour Act 2003 provides police with a power to establish and enforce dispersal zones, where there are reasonable grounds to believe there is persistent anti-social behaviour. Authorisation may not be given without the consent of the local authority. Dispersal Zones are not curfews or blanket bans. They do not prevent anyone from entering the designated area, but they address anti-social behaviour through curtailing two or more persons present in that area for up to 24 hours. The dispersal zone will cover: Dorset Road, Fentiman Road, Meadow Road, Carroun Road, Usborne Mews, Richbourne Terrace, Oval Place, Palfrey Place, Kibworth Street, Bolney Street, and the entire Bolney Meadows Estate and its communal areas. The metropolitan liberal within wants to write how the dispersal zone around my little patch of South London is an infringement on human liberties. But I'm actually a flag waver for the scheme, and hope the local police use their full power to move on the nasty people that are making living around SW8 such a pain right now. It comes to something when the very values, morals and principles that you pride yourself upon, are pushed to the opposite end of the political spectrum because of the behaviour of others. It pains even more when those 'others' are the very people that your values, morals and principles should naturally try and protect. I get kids smoking pot in my stairwell, and congregating outside my block of flats - not exactly the best feeling when you're coming home in a suit with a laptop bag. But do I think a dispersal zone is the right approach? No. Call me a pinko-liberal, but what will this solution achieve? It doesn't take kids off the street, it just moves them onto a different street - it seems to smack of a short term NIMBYist plaster. If people are committing a crime, arrest them. You don't need a dispersal order to do this. If kids are loitering and causing low-level problems such as harassment, graffiti, or using soft drugs, would it not be better to actually work *with* these kids to give them more opportunities and prospects, rather than just giving up on them and slapping dispersal orders on them? In central Stockwell the Plod will have to disperse everybody because there are no public toilets - they recently threatened a severely disabled pensioner with an £80 fine because he got caught short. STAND UP FOR STOCKWELL - maybe its a one liner STAND UP joke - it sure aint doing nothing for central stockwell public toilets not even responding to suggestions made - it's not only the Lib Dems that are up the creek.